Markets have fallen. You won’t know it looking at the Nifty, but the midcaps have fallen over 18% this year, and the small caps, are down nearly by a third! 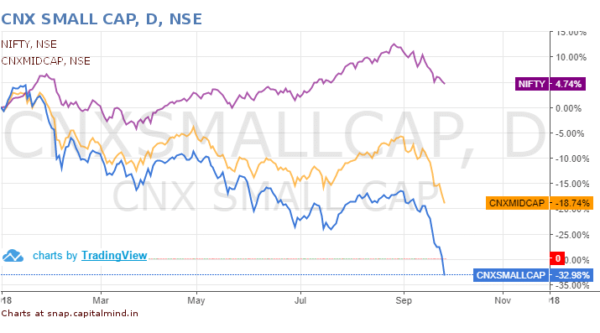 This is of course of mega concern if you own most non Index stocks – in fact even the Nifty Next 50 is down 15% in 2018. What do you do in such a fall? There’s no single answer. But these are rough times, and let’s see what the situation is. Stocks have corrected. 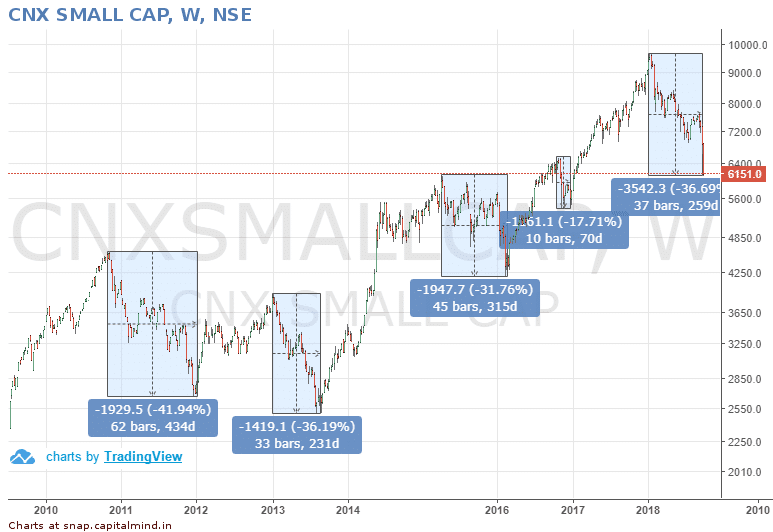 For small caps, this is a fall to levels last seen in end 2016, when the market fell after the demonetization announcement. I wish I’d bought stocks then. It’s nearly two years since. And we’ve had earnings growth (at least some of it) since then. There is blood on the street. No one wants to buy because well, because. Tons of bad things happening and we’ll get to that, but think of this first: Are you super uncomfortable buying now? Because your stocks will get beaten up more? If the answer to that question is “yes!”, then it might just be a good time to start buying. Start Buying? Not just sell your house and buy? What’s with that? If you’ve been through bear markets you know one thing – they can frustrate you with their longevity and get you super impatient. Markets don’t respect your time. Markets do what they want to do. But how long and how deep have previous falls lasted? We have data since 2007 and then there was the massive crash of 2008. Let’s assume for a moment that this is not 2008 – not because it’s special but because the factors that caused 2008 were more global in nature, and the fall was more “secular” – you had even the Nifty correcting 60% as well. Since 2008, we’ve had a few tumbles – in 2011, 2013, early 2016, late 2016 in demonetization and the current correction. We’ve mapped out the drawdowns on the index level in each such case. As you can see, this is roughly about the same time and same intensity as the corrections in the past. The Nifty Itself: Stocks Aren’t Exactly Glorious. The Nifty is about 8% below it’s all time high. But the stocks in it – the 50 stocks comprising the Nifty – show a different story. 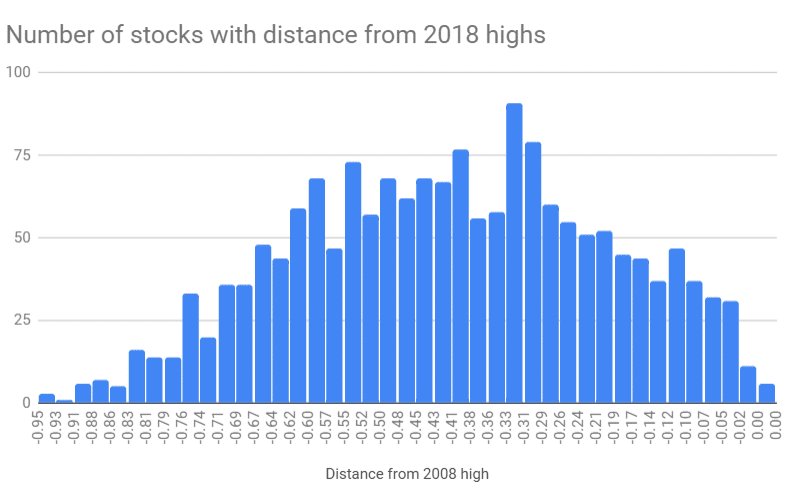 Out of them, 35 stocks are down over 10% from their highs in 2018. 17 of these are down over 25% – with Yes bank leading the way at 53% drawdowns. In fact there are only 126 stocks where we’ve seen a less than 10% fall from the highs. Valuations wise, things have gotten a lot better. The Nifty P/E still shows 26 or so, but we recalculated this using “consolidated” numbers, and found that the P/E is only 22. This is still high, and in general, smaller cap indexes are at even higher P/Es, but some stocks now trade at sub-10 P/Es and grow at over 20% – and they’ve fallen 40% to 50% in the last few months. Their valuation, relative to their own growth, has moved, perhaps, from “Fair/Expensive” to “Maybe They’re Shutting Everything Down”. But Aren’t We Going To See Major Earnings Drops? Debt? Dollar? At Capitalmind we have been cribbing that earnings haven’t been going anywhere. And indeed they haven’t, but in the last quarter we started to see a small recovery in earnings (driven perhaps by the GST lousiness last year). If – and this is a big if – the banking sector madness is done, we should start seeing recovery in PSU bank earnings by the December quarter and they have indeed been responsible for bringing down aggregate earnings in general. A good portion of our larger stocks are exporters. They’ll do well too with a weaker rupee. The economy itself is doing well. Discretionary spends seem to continue as usual, and while there are some setbacks due to floods, we believe the rebuilding of the flood areas will result in an even higher interest. We hear news that petrol prices will cause inflation or hit auto sales – till now, this does not seem to have happened either. Interest rates have been high on the back of fear that global rates are rising. But we must note that Indian inflation is benign, even as the dollar has crept up to 72. Inflation could rise of course, what with India being a importing country overall, but the problem with the dollar isn’t the fact that we are net importers – we have always been that – but the fact that we aren’t getting as much in terms of inflow as we used to. Most of those inflows are equity inflows (FDI or FPI) and in effect, with lower inflation, the way to help our currency might actually be to reduce rates, not increase them. Debt rates have been high due to liquidity pressures as well. This has now eased up substantially, and debt markets are alive and kicking. The Il&FS default had created an issue where people started to get scared to give money to financial companies, but even that will be sorted out soon as they transition their fund raising measures to longer term products. At yields of 10%+, some of the corporate bonds in the market are at juicy levels. It seems like this: There’s fear and panic in the stock markets. There’s some uneasiness in debt markets. The rest of the picture doesn’t look horrible just yet. And stock valuations are far better than earlier. But The Fear Is Companies Will Default? Of course. And fear is what makes people sell in panic. Panic is a great time to buy things. Yes, DHFL has fallen 70% or so. But along with it, a bunch of reasonably strong financial companies have cracked too. A Bajaj Finance might still be expensive, but it’s 30% less less expensive than it used to be. Even an HDFC Bank is cheaper, as is HDFC, and a bunch of others. Additionally, their bonds have also become cheap (and therefore at a higher yield) because of this fear. Take technology. Admittedly some of them have run away this year, but the sector has typically no debt and a low p/e ratio. Other than TCS, most of the large IT firms are trading at P/Es of less than 20, and in many cases, less than 15. There’s likely to be a big bump in earnings this quarter onwards, due to the dollar depreciation and the major economic boom in the US. Panic makes people sell everything, so they’ll also sell the no-debt names. And in pockets, people that sell in panic – due to either fear or margin calls – sell at any cost. Means you can buy if the price is totally out of whack. It will probably take upto 6 months for the madness to resolve. It could happen tomorrow, of course. But it could easily go on till the elections. 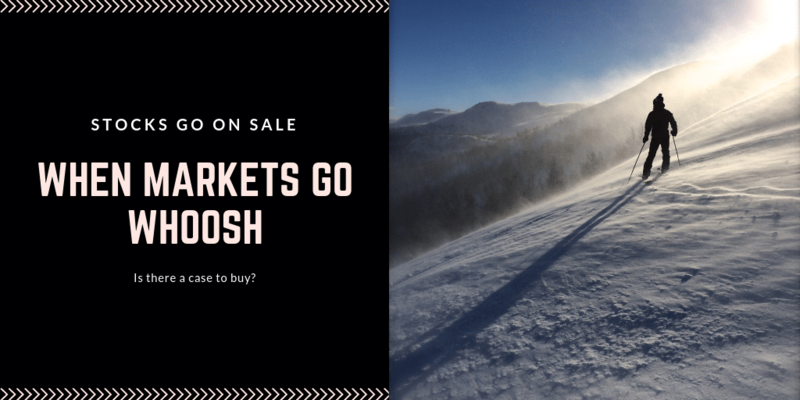 So there’s a thought – how does one buy if you want to? Distress can easily turn into more distress. If you buy so selectively that you have got to be 100% right in order to make a good return, then you have to be super sure of the companies you buy. That’s difficult in a crisis, because there is too much fear, rumour and panic. So you diversify, somewhat. If tech exporters look good, buy a whole lot of them. What survives after a few months will be the winners – and then you can ride them further. No matter what portfolio you build, you will end up with a few stocks determining your long term returns. You might just want to reward them with more of your capital. It’s also useful to spread the investments over some time. If you buy at one go, you have a behavioural problem. Meaning your head gets wonky. The price has to recover. Otherwise you have this knot in the stomach. Nothing is worth knots in a stomach. If you want knots in a stomach, I would suggest sky diving instead. There will be unknown unknowns. You can’t predict what you don’t know or can’t imagine. So when bad stuff happens, how do you react? Will you buy more? Will you exit a bad investment? Or just reallocate the remaining money to the good stuff so that the bad stuff becomes smaller and smaller in comparison? You don’t have to win every battle. You just need to win enough so that your losers don’t hurt you. Also, exiting a bad stock isn’t the worst thing in the world. You want to give each stock some time. Say a year or two. After that, you just need to move on. There’s more than enough in terms of blood on the streets. On average, most of these stocks won’t recover. Perhaps 2/3rd of them won’t. But that still leaves you with enough room to buy – and at valuations you would have loved earlier. If nothing has changed, and you spread your investments over the next few months, and the market looks so bad that it’s definitely going to get worse because everyone says so, the time may have come. For all the bearish commentary we’ve done in years, this is one of those times that looks like the market might be ignoring some really green shoots on the ground. Sorry for the gyan. There’s too much advice on the internet anyhow. But I hope the perspective helps.